I'm sure until quite recently you could still see the gateposts to the Climax factory on Mile Lane. I have a great photo of Jim Clark driving a fork-lift there somewhere. As a telephone engineer I worked in Cov Climax, from what I remember the car park was opposite, over the road I think it was next to Securicor office, worked in there also. I loved the old photo, thanks for putting it on here. Colin. Does anyone remember what the printers was called in Mile Lane. It would of been opposite the school. I think it could well be part of the Ibis hotel now. Also was there a martyrs memorial nearby in Quinton Road. Hi Pat I don't recall a printers, I recall Rolls Royce, Armstrong Siddeley, as I used to work in the next road Quinton Road, Pistons Ltd, I'm sure someone on here will know, you could ask on the other Mile Lane thread on here, where they are discussing Mile Lane and the factories there. 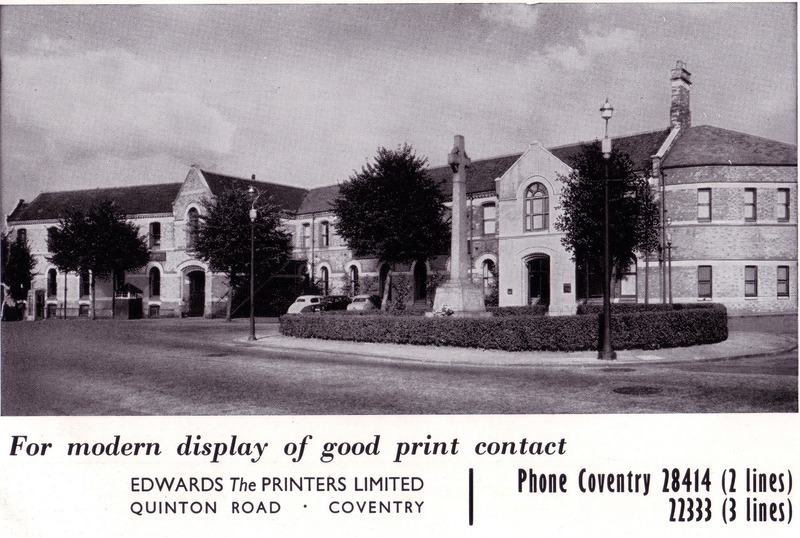 It was Edwards the Printers and was next door to Cornercroft. It was formally the Swift Motor Comp (see other topic) and is now the front of the new hotel. Thank you Heritage. You've settled my mind now. Also I now remember Cornercrofts. On 30th Sep 2012 7:44am, heritage said: It was Edwards the Printers and was next door to Cornercroft. It was formally the Swift Motor Comp (see other topic) and is now the front of the new hotel. Thanks NeilsYard. That photo I think shows the memorial too. Long before the ring road took over. Not entirely sure what the memorial was about though. Will try to find out. Mods note: A separate thread "Coventry's Martyrs" has now been established.